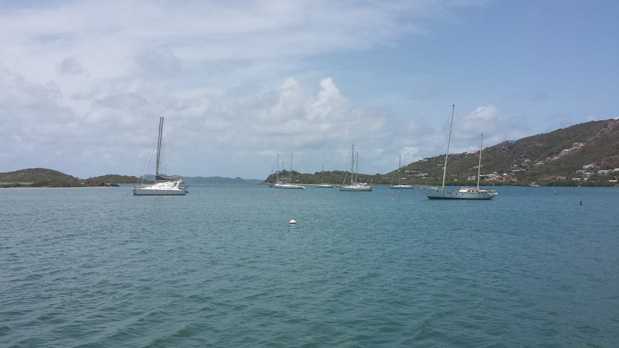 Penn’s Landing Marina is a tranquil private marina, situated in the well-protected waters of Fat Hog’s Bay on the S.E. end of Tortola in the beautiful British Virgin Islands. Just a 5 minute drive from Beef Island Airport, this tropical oasis awaits your arrival. Relax and enjoy a cold drink at the bar, or dine waterfront in the award-winning Red Rock Restaurant, nestled beneath the palms. Penn’s Landing Marina is a Caribbean treasure, with 12 slips, a dinghy dock and 20 moorings surrounded by a spectacular view. Customers will enjoy access to the internet and our immaculately clean washrooms and showers. Easily accessible by dinghy is the Riteway Grocery for provisioning, a Laundromat with drop off service available, ice, propane and 2 fuel docks. A short taxi ride will take you to calm Long Beach, or the surfer’s paradise, Josiah’s Bay.